Whether you are an investor or potential collector, knowing which gold coins are the most popular will save you from making costly mistakes that could ruin what should be a pleasant and rewarding experience. There are several advantages to buying the most commonly traded gold coins, not the least of which is that greater competition among sellers results in significantly lower premiums than you are likely to pay for less popular gold coins. The flip side is that there will also be more ready buyers should when the time comes to sell. A single list will not suffice, however, because there are two very different classes of gold coins. Bullion gold coins are in current or recent mintage and their value depends mostly on their content of pure gold. Rare gold coins, on the other hand, have added numismatic value that can easily be many times the value of their gold content. Beginning collectors often find modern gold bullion coins to be appealing because they provide an opportunity to learn about gold coinage before venturing deeper into numismatics. For investment purposes gold bullion coins are generally preferred for short-term speculation while many believe rare gold coins to be superior for long-term growth. Regardless of your intent or preference, the safest way to begin is with the most popular gold coins. For that reason, separate lists for the ten most popular gold bullion coins and the ten most popular rare gold coins will be presented here. In compiling this list of the ten most popular gold bullion coins, considerable weight was given to those that have had long and consistent mintages. Such coins are the most abundant and their track records are well established. One-ounce is the most heavily favored weight for gold bullion coins by far and that is the standard weight of each of the coins listed here. However, many of these coins are available in fractional weights as well for price-conscious buyers. Although popularity is a subjective trait, and consequently difficult to gauge, there is surprisingly little debate over which coins belong on the top half of the list. Beyond that things are not so clear. Modern collectible gold bullion coins, for example, are often considered to belong in a separate class. Two are included here, however, because without question both are immensely popular. Finally, rounding out any list means selecting from a fairly large pool of less popular, but still commonly traded gold bullion coins. The last three here are a good representation of that pool, but others such as the French Gold Rooster, Swiss Gold Franc, and Mexican Gold Peso are often found on other lists. Each of these gold bullion coins is described in detail below. American Gold Eagles are the most popular 22-karat gold coins in the world and they account for over 80% of the gold bullion coins purchased in America. Gold Eagles are minted in weights of 1/10, 1/4, 1/2, and 1 ounce with face values of $5, $10, $25, and $50 respectively. These coins contain 91.67% gold, 5.33% copper and 3.0% silver, an alloy that provides durability as well a beauty. All American Gold Eagles share a common design. The obverse is a stunning tribute to Augustus Saint-Gaudens’ masterpiece, the 1907 Double Eagle, one of the most beautiful coins ever struck. Lady Liberty, her hair blowing in the wind, seems to stride off the surface holding an olive branch in her outstretched left hand and a torch in her right. On the reverse, in a dramatic symbol of family tradition and unity by sculptor Miley Busiek an eagle with an olive branch clutched in his talons descends to his mate and her hatchlings. The American Gold Eagle stands alone as the premier gold bullion coin and the availability of fractional weights make it possible for even people on a tight a budget to enjoy these iconic American coins. In mintage since 2006, the American Gold Buffalo was the first 24-karat (0.9999 fine) gold coin ever struck in America and is among the world’s most pure gold coins. The Buffalo is minted only in one-ounce weight with a face value of $50 the only exception was 2008 when 1/10-oz, 1/4-oz, and 1/2-oz coins were also minted. An uncirculated 1/2-ounce Gold Buffalo was also packaged with an uncirculated 1/2-ounce Gold Eagle in the 8-8-08 Double Prosperity set. 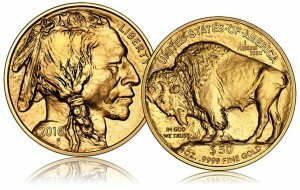 The American Gold Buffalo carries on the James Earle Fraser design for the Indian Head (or Buffalo) Nickel introduced in 1913. Fraser used the combined features of chiefs from three different American Indian tribes – Big Tree, Iron Tail, and Two Moons – as a model for the stern, chiseled face of an Indian warrior on the obverse is. The buffalo depicted on the reverse is thought to be Black Diamond, a bison living in the New York City Central Park Zoo at the time. As the story goes, Fraser had someone distract Black Diamond while he sneaked in close enough to sketch the animal in profile. Both the obverse and reverse of the American Gold Buffalo recreate Fraser’s design in stunning detail and relief, making the coin an instant and perennial favorite. Introduced in 1967, the South African Krugerrand was the first legal tender gold coin struck for the purpose of private gold ownership. The reverse portrays a Springbok (literally “jumping antelope” in Afrikaans), the national symbol of South Africa under white minority rule. The bust of Paul Kruger, the last president of the Republic of South Africa, is on the obverse. Like the American Gold Eagle, the Krugerrand is struck from 22 kt gold/copper alloy for improved durability. For the first 13 years the Krugerrand was minted only in the one-ounce weight, but beginning in 1980 weights of 1/10, 1/4, and 1/2 ounce have also been produced. Krugerrands have been so consistently popular with investors over the years that more than 1500 tons of these gold bullion coins have been struck to date. It is the Royal Canadian Mint’s obsession with purity, not the design, which earns the Canadian Gold Maple Leaf its spot on the list. The typical Gold Maple Leaf is struck from 99.99% pure gold, but a few special issues have contained 99.999% (“five-nines”) pure gold, the only gold bullion coins ever minted with that purity. The Canadian Gold Maple Leaf was introduced in 1979 in direct competition with the Krugerrand. Its simple design, featuring Queen Elizabeth II on the obverse and a maple leaf on the reverse, has never changed. Gold Maple Leaves are produced in weights of 1/20 ounce ($1), 1/10 ounce ($5), 1/4 ounce ($10), 1/2 ounce ($20), and 1 oz ($50). When the Royal Canadian Mint launched a new series of five-nines 1-oz bullion coins in 2007, it also unveiled a monstrous 100-kg (3,215.1 troy ounces) Gold Maple Leaf of the same purity with a face value of $1 million. At least five of those coins are known to have been produced. By 1983 the Canadian Gold Maple Leaf had become the most popular 24-karat gold bullion coin in the world and today it is one of the most heavily traded of all gold bullion coins. The 24-karat Austrian Gold Vienna Philharmonic has been a favorite in Europe since it was first struck in 1989. The coin is unusual in that it was originally denominated in Austrian shillings but since 2002 it has been the only regularly issued gold bullion coin denominated in Euros. At nearly 1 1/2 inches, the Philharmonic is also the world’s largest diameter one-ounce gold bullion coin. 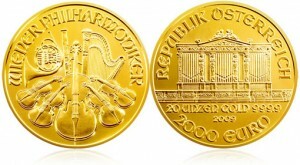 The obverse of the Gold Vienna Philharmonic features a montage of a cello flanked on each side by two violins in front of a Vienna horn, bassoon, and harp. The reverse portrays the Great Organ in Vienna’s Golden Hall, the venue of the Vienna Philharmonic Orchestra. According to the World Gold Council, Vienna Philharmonics were the best-selling gold bullion coins in the world in 1992, 1995, and 1996, and they remain immensely popular today. The Chinese Gold Panda was the first gold bullion coin intended to have immediate numismatic value. Since they were first struck in 1982, yearly mintage of Chinese Pandas has been strictly limited. Produced in 0.999 fine gold, each year features a different panda design on the reverse (with the one exception of 2001, which carried over the 2000 design). The obverse of the Chinese Gold Panda portrays the Hall of Prayer for Good Harvests at the Temple of Heaven in Beijing. The Peoples’ Republic of China is inscribed in Chinese across the top with the year of mintage on the bottom. While keeping the same theme, the obverse was redesigned in 1992 and then again in 2000. The universal appeal of the panda bear, collectability, limited production and the availability of fractional weights down to 1/20 ounce combine to make the Chinese Panda worthy of its position on the list and is an excellent choice for budding collectors. The Australian Gold Kangaroo is another collectible series with limited mintage. The Kangaroo was introduced in 1990 to replace the Gold Nugget, Australia’s standard gold bullion coin since 1987. That coin was named for its depiction of the Welcome Stranger nugget, which at 2,284 ounces is the largest nugget ever found. From 1990 until 2008 the word “Nugget” still appeared on the obverse. The beautifully rendered 24-karat Australian Gold Kangaroo features a unique frosted design that gives it a two-tone effect. On the obverse, a bust of Queen Elizabeth II faces to the right. Each year a unique variation on the kangaroo theme is featured on the reverse. The one-ounce Australian Gold Kangaroo has a face value of $100. Fractional denominations of $5, $15, $25, and $50 are also produced with weights of 1/20, 1/10, 1/4, and 1/2 ounce respectively. The Perth Mint also introduced the concept of “jumbo” gold coins with the Kangaroo, including a one-kilogram gold bullion coin that is the largest in regular production. The Australian Kangaroo has been a popular choice for gold bullion coin investment since first introduced in 1986. Along with the Lunar Series, which ended in 2007, the Kangaroo is also a favorite with collectors. The Austrian Gold 100 Corona was among the first products available to Americans when the ban on private possession of gold was lifted and being 0.900 fine (21.6 karat), they are one of the most durable gold bullion coins available. Coronas are slightly lighter than most gold bullion coins, weighing 0.9802 ounce. The Austrian Coat of Arms featuring a crowned double eagle is portrayed on the reverse with the motto, Viribus unitis (with united forces), inscribed on the edge. 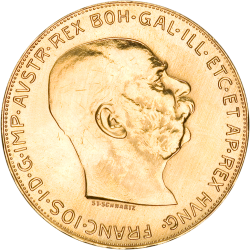 The obverse bears the likeness of Franz Joseph I, Austrian Emperor from 1848 to 1916. Modern Austrian Gold 100 Coronas are restrikes of the mintage year 1915 and they are no longer minted or promoted. However, due to their relative obscurity Coronas carry unusually low premiums, which makes them appealing to bargain hunters and worthy of a spot on this list. The Mexican Gold Libertad carries on the country’s long tradition of exquisite gold coinage. The 0.999 fine Gold Libertad has the same design as its predecessor, commonly called the “Onza.” On the obverse Winged Victory, grasping a laurel wreath in her right hand to symbolize victory and broken chains in her left hand to symbolize freedom, stands atop a Victory Column. In the background are the volcanoes Popocatépetl and Iztaccihuatl, named for two Aztec lovers in Mexican folklore. The reverse portrays the Mexican coat of arms. Both the Onza and the Libertad contain the same quantity of pure gold, but the Onza is 10% heavier than the Libertad because it has a 10% added alloy mix to fortify the coins. Both are unusual among modern bullion coins in that they bear no denomination and therefore are not legal tender. Beauty, rich cultural significance, and availability in fractional weights as small as 1/20 ounce make the Mexican Gold Libertad a good choice for any collection or portfolio. The Gold Britannia is unusual for British coinage in that it is struck from 22-karat, rather than 24-karat, gold. From 1987 through 1989 the balance of the content was copper and from 1990 onwards it has been silver. As with all British coins, the obverse of the Gold Britannia bears the likeness of Queen Elizabeth II. The reverse bears a variety of depictions of Britannia, the female personification of the country wearing a centurion’s helmet and armed with trident and shield. The symbol dates back to 2nd century Roman occupation. The variations in design of the obverse, each stunning in its own right, make the Britannia a worthwhile part of any collection as well as a sound investment. New gold bullion coins are introduced almost every year, and many are certain to be future contenders for a list such as this. Much as they did in the late nineteenth century, countries are vying to produce the most beautiful coins in the world. A great many other, equally beautiful coins exist in relative obscurity. Whether you are a collector or investor, or a little of both, the possibilities are as endless as they are rewarding. Putting together a list of the most popular rare gold coins that would satisfy even a plurality of seasoned collectors would be virtually impossible. Gold coins were introduced in the sixth century B.C. and well over 10,000 different types have been struck since then. However, because safety and security in purchasing rare gold coins are paramount, this list is taken from a much smaller field – American gold coins. American gold coins are popular, familiar, and plentiful. Although they were produced for only a relatively short time, the historical richness and beauty of American gold coinage are more than sufficient to satisfy the needs of investors and novice collectors alike. 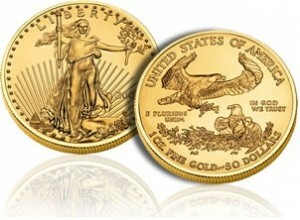 This list is but a sampling of the most popular and highly prized rare American gold coins. The Saint-Gaudens Gold Double Eagle is widely considered to be one of the most beautiful gold coins ever minted. Lady Liberty strides out from the obverse, lighting the way with a torch held high in her right hand and offering peace with an olive branch in her extended left hand. Around the circumference are 46 stars, representing the states in the Union. Two more stars were added in 1912 when Arizona and New Mexico were admitted. The reverse is adorned with an Eagle in full flight over the sun. The original 1907 Saint-Gaudens Gold Double Eagle was struck in dramatic high relief, but the difficulty of stacking them and a complex minting process that required up to 11 strikes made them impractical for circulation. The coin was redesigned in standard relief after only 12,367 of these exquisite high relief coins were struck. The Saint-Gaudens Gold Double Eagle is an essential part of any gold coin collection and is a widely acknowledged benchmark for rare gold coin investment. The Liberty Double Eagle was the first $20 coin minted in America, created in response to demand for larger-denomination gold coins as inflation ran rampant through the boom towns of the Gold Rush. 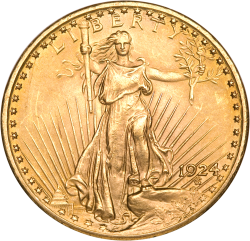 The Liberty also had the purest gold content of any U. S. coin of the era. One of the most imposing images of an eagle to be found on any American coin graces the reverse of the Liberty Double Eagle. 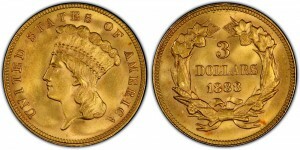 The Indian Head Gold Eagle was the second coin designed by Augustus Saint-Gaudens. The obverse features Liberty wearing a feathered bonnet with thirteen stars encircling her head. There was considerable controversy over that depiction when the coin was first unveiled, but the public was soon won over by its extraordinary beauty and symbolism. The motto “In God We Trust” was initially omitted from the reverse, but was added in 1908 by Congressional mandate. Also in 1908, forty-six stars were added on the edge to represent the states of the Union. Two more stars were added for Arizona and New Mexico in 1912. 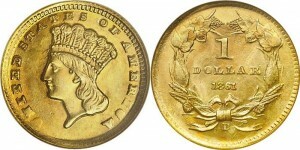 Gobrecht based the obverse of the Liberty Head Gold Eagle on the Coronet design that debuted with the 1816 Large Cent. That design, which features a more matronly Liberty, is commonly referred to as “Matron Head.” The reverse of the coin portrays an eagle with shielded breast and wide-spread wings, perched atop a branch with a sheath of arrows clutched in its talon and about to take flight. The Liberty Head Gold Eagle was one of the most heavily circulated coins in U.S. history. Unusually large numbers of the coin were preserved due to widespread hoarding during the Civil War, which makes the Liberty Head Gold Eagle an excellent choice for collectors and investors alike. Augustus Saint-Gaudens died before he was able to complete his commission to redesign American Eagle coinage and the task fell to Bela Lyon Pratt, one of his students. Rather than carry over Saint-Gaudens’ controversial design, Pratt chose a striking profile of an Indian chief in full-feathered headdress for the obverse of the Indian Head Gold Half Eagle. The reverse bears the profile image of an eagle standing with its wings folded, similar to Saint-Gaudens’ design. Unique among American coinage, Pratt’s designs were incused, with the details sunken into the field of the coin rather than raised above it. Fear that the recessed features would harbor bacteria caused the Indian Head Gold Half Eagle to be so unpopular with the public that far fewer of these coins were preserved for posterity than were other gold coins. Furthermore, Pratt’s coins did not have the usual protective rims and consequently higher mint-state Indian Head Gold Half Eagles is extremely rare. None-the-less, the unusual characteristics of the coin make even the lower grades very appealing. The Liberty Head Gold Half Eagle shares its design with all but the double eagle in the series. The obverse of the coin features the Coronet, or “Matron Head,” Liberty design and designer Christian Gobrecht’s classic heraldic eagle is on the reverse. From 1839 to 1865 the Liberty Head Gold Half Eagle was struck without the words “In God We Trust,” but that “No Motto” version is extremely rare today. From 1866 through its final mintage in 1908 the motto is present on the coin. The Liberty Head Gold Half Eagle is unique to American rare gold coins in that it is the only one to have been struck at all seven mints. As it was with the other Indian Head gold coins designed by Bela Lyon Pratt, the public was leery of the incused design of the Indian Head Gold Quarter Eagle out of fear that bacteria hid in the recesses on the surface. Production of the Indian Quarter Eagle halted from 1916 until 1925 and then ceased entirely five years later. Sporadic production together with being the last Quarter Eagle ever minted has made the Indian Quarter Eagle particularly popular with collectors and investors alike. As he did with all of his coins in this series, designer Christian Gobrecht based the obverse of the Liberty Head Gold Quarter Eagle on the Coronet, or “matron Head,” design. Likewise the reverse bears his iconic eagle moments before taking flight. The Liberty Quarter Eagle earned its place in the record books by having 33 years of mintage without a design change – the longest of any American gold coin. Because of its convenient size and denomination the Liberty Head Gold Quarter Eagle was exceptionally popular with the public in its time, and it remains so today with both collectors and investors. The Indian Gold Dollar is in fact the Liberty Gold Dollar, which makes its design one of the most misinterpreted ever. Engraver James Longacre modeled the image of Liberty not on an Indian princess but on a Romanesque marble statue he had seen in a Philadelphia museum. The “headdress” is actually an ornate crown. That notwithstanding, the public dubbed the coin the “Indian Head” and it has carried that name ever since. Longacre’s design for the reverse of The Indian Head Gold Dollar is even more notable. In a stark break from tradition, instead of a grandiose depiction of a heraldic eagle the reverse bears a simple wreath of the primary cash crops of his time – tobacco, wheat, corn, and cotton. This third and final variation on the Indian Gold Dollar was the only one to endure. The Type III Indian Gold Dollar remained in mintage for more than 30 years. No one is certain why the $3 Gold Indian Princess was originally created. Some say it was to simplify the purchase of sheets of 100 3-cent postage stamps while others suggest that it was likewise but for rolls of 100 3-cent silver pieces. Perhaps it was just a convenience in light of the flood of gold discoveries and soaring prices in the gold camps. Whatever the reason, the $3 gold piece was minted for only 36 years, the shortest-lived mintage of any denomination of circulated American gold coins. Although the coin is actually one of the Liberty Head series, it was dubbed the $3 Gold Indian Princess by the public because they mistook Liberty’s Romanesque crown on the obverse for an Indian Headdress. For the reverse, engraver James Longacre used the same novel and understated wreath of primary crops that he had used for the Indian Gold Dollar. Longacre’s intent was to make his coins more readily distinguishable from quarter and half eagle coins. Its unique denomination, innovative design, and low total mintage make the $3 Gold Indian Princess one of the mostly highly prized gold coins on the market today. These lists are intended only to suggest a sound starting point for venturing into the wondrous world of gold coins. The popularity of these coins will let you test the waters with maximum assurance that you will be able to divest of your assets should you discover that world isn’t for you. Chances are, however, that you will want to continue. If you do, these coins will provide you with an excellent foundation for your collection or portfolio. As you begin to explore further you will soon discover that much, much more lies beneath the surface that we have barely scratched here. For pricing and volume discounts call 1-800-425-5672 or receive your free guides by clicking below.